One of the most common complaints I hear about from riders is that their lower back gives them problems. It could be tight, weak, sore or even painful but on some level their low back is affecting how well they can move and ride. Over the years I’ve seen this problem just get worse as more and more people take up our sport of mountain biking without the requisite movement and strength needed. They also get a lot of bad advice that leads to excessive stress on the low back when riding as well. Add it up and you have a recipe for disaster, which is why low back pain is almost an epidemic in our sport. Fortunately, unless you have a diagnosed issue like a bulging disc or other acute injury there are things you can do to improve and even eliminate your low back pain. In this new episode of the BikeJames Podcast, I share the 3 most common causes of low back pain in mountain bikers and the top 3 solutions to help you improve it. While everyone is different, these are some of the lessons I’ve learned in working with hundreds of riders and I hope they can help you too. If sitting is the new smoking then what does that make seated pedaling? Idea that you need to sit down for traction is a myth and while it takes some practice, you can get really, really good with standing pedaling, especially if you are using the other 2 solutions. 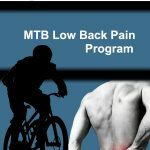 Discover the simple 3 Step Formula that will reduce low back pain both on and off the bike so that you can ride as long and fast as you want while doing it all pain free. Instantly improve your hip mobility and core strength with the only program designed to target the real causes of low back pain on the trail…too much seated pedaling! In only 30 days you’ll completely change your hip mobility, trail specific core strength and ability to stand up more, letting you ride with less pain and have more fun on the trail. I’ll turn 37 this weekend. I’ve been riding bikes all my life for pretty much everything (I’m from The Netherlands), been playing soccer between 6 and 13, then quit and started running (off road, loose sand, forest etc) instead. At 18 I got into rowing where I discovered I had developed horribly short hamstrings over the years. I trained daily (both in the boat as well as strength in the gym) and put a lot of effort trying to stretch them. The result was minimal. A year later I moved to a different town, different rowing club but I thought they were too much elitist nonsense so I got into mountainbiking instead. In no time my hamstrings were as short as they were before. Now I’m about double that age, get about four mtb (about 60-90mins) rides in a week (kids), commute for about five hours a week (catalyst pedals on a regular road bike) and another four hours on the cargo bike (shopping, kids etc). Some mtb rides become MUni (mountain unicycle) rides or runs (trail) when the weather turns bad to preserve the mtb trails. As a teacher I spend less time sat down than someone with a typical office job. My mtb rides are all saddle down type riding, only sitting on the mellower transition bits. All climbing, harder and/or technical riding is done standing. The other rides (commute etc) are mostly sat down though. Not sure how hard I’m pushing there. I logged a few rides and am usually somewhere around z2, for what it’s worth. Following popular advice (including yours) I quit climbing in a light gear half a year ago. I now run an oval (Blackspire) 32t ring in front, 11-32 cassette in the rear, 26″ wheels. Not sure what gear I’m climbing in, but it can’t be lighter than 1:1. So I’m pushing harder and make it up the hill just fine. I recently noticed some slight pain coming up in my right hand lower back when climbing like that. It is not a problem with any other activity, including the commute rides. So I want to be ahead before it turns into an issue. So far it only seems to hold me back when paddling the kayak, to keep my body upright with the legs stretched out. That hurts. I suspect my short hamstrings (hence limited mobility) to be the culprit. Any chance I could still increase that mobility after so many years of already short hamstrings and such activity? Of course I could always work on more strength. What’s your take on the considerable time I spend sat down riding to work etc? I tried standing up more but I then can’t help myself going faster and faster. Also, what’s your take on dropper posts? I currently just drop the saddle and leave it there. But as you recommend to spend the easier bits sat down, would you advice to raise the saddle there or doesn’t it matter much? I’m not eager to get one as the costs are prohibitive considering their reliability and vulnerability (and they just don’t fit my current frames with 26.8 and 27.2mm seattubes). Unless you really recommend raising the saddle to avoid lower back pain. Thanks for going through all this. And if it is all covered in the program, I’ll find it. Cheers! You should be focusing on your mobility as part of a daily practice and something that is just what you do. You can increase mobility at any age but you have to just make it part of your routine. And it is really a matter of how much really hard pedaling you are doing sitting down but in general the more you sit the more you have to do something to counteract the effects. I like dropper posts but mainly because I can lower my seat in more places, not because I can raise it up more. I don’t think they are needed and can actually be used to force you to stand up more.